Rare 32 voice version. Expanded sequencer memory. Poly-aftertouch!!! 32 voice version. Expanded sequencer memory. Polyphonic aftertouch!!! This item includes an OS disk (Version 4.10) and a small stack of 3.5″ floppy disks containing programs (sounds). “Amazing early 1990s Ensoniq synthesizer. This was the end of the VFX line of transwave synthesizer. 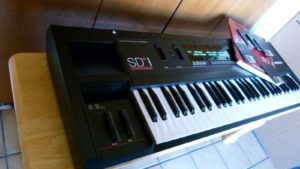 The SD-1 has more waveforms that the VFX-SD + the mega Piano. Capable of rich complex evolving synthesizer pads etc. Layer 6 waveforms to create complex sounds not unlike the Korg Wavestation only THIS machine is a breeze to program. Unit has been powered up and tested. No broken keys, buttons or missing sliders. 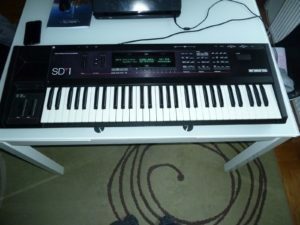 “Selling this Ensoniq SD 1 Synthesizer. Has 1 disc, 61 keys and case. Unit and case are in excellent condition and sounds beautiful.” Auction ended. Click here to browse on eBay. “This in an Ensoniq synthesizer, it needs some TLC, seems to work still however part of the display when it is turned on doesn’t show up. It may need a new fuse, it has been played alot. The words along the top and backside of the player are starting to fade off. Comes with 2.0 OS disk. I have also included a microphone as well as 3 instrument cables and a radio shack video distributing amplifier. May be good for parts or with a little tinkering it could perform wonderfully. ” Auction ended. Click here to browse on eBay. 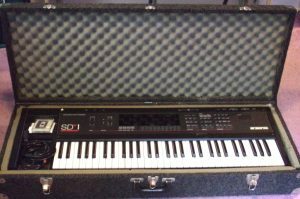 “You are looking at a……….. USED ENSONIQ SD-1 VINTAGE SYNTHESIZER SEQUENCER KEYBOARD FOR PARTS OR REPAIR. Keyboard shows heavy wear mainly on the paint as shown on pictures. It does power up but shows on display: ” KEYBOARD CALIBRATION ERROR RECALIBRATE IGNORE” No other further test selling as is condition for parts or repair NO RETURN!” Auction ended. Click here to browse on eBay. 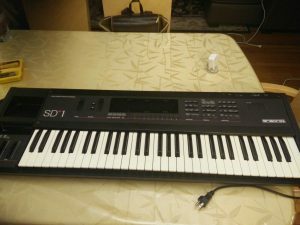 “Vintage ENSONIQ SD-1Synthesizer ….. Does NOT have power cord, I have no way of knowing if it works or if there are pieces missing. It is in good cosmetic condition for it’s age (1991), it could use a little cleaning. Comes with case (not sure if it’s the correct case) but the case shown, is included. 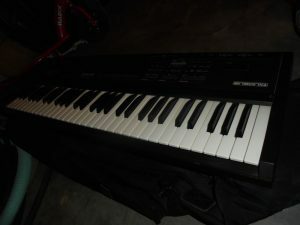 Has small, red paint spot on one of the keys (shown in picture).” Auction ended. Click here to browse on eBay. It also has an excellent (and very easy to use) 24 Track sequencer. for a 20 year old keyboard synth.